Government. 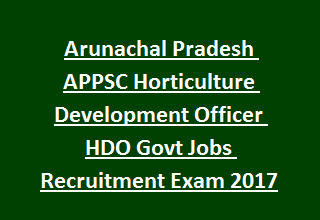 There are total 6 vacancies in APPSC HDO Recruitment 2017. Candidate’s selection will be through written exam and viva voce. Mode of application is offline only. Filled application form to be reached to APPSC on or before 13-11-2017 by 04:00 PM along with all necessary certificates and documents for this Horticulture Development Officer Jobs. Age limits, salary, application process and other details are given below for this APPSC ADO Vacancies recruitment notification 2017. There are total 6 posts in this APPSC ADO Jobs recruitment 2017. As on 13-11-2017 candidates age limits are 18-30 years. For APST candidates 5 years of upper age relaxation is given. Candidate must have qualified Degree in B.Sc Horticulture from any recognized university. Rs.100 for APST candidates and Rs.150 for others and fee to be paid trough DD/IPO in favor of Secretary, APPSC, Itanagar, Arunachal Pradesh. Candidates will be selected through written exam and viva voce or interview. Written exam will be conducted for 400 marks. Topics are given below. Horticulture Science syllabus will be degree level. Candidates who are interested in this APPSC HDO jobs they can submit their application form in a prescribed format along with all related documents and DD/IPO to APPSC on or before 13-11-2017. See the official notification here for APPSC Recruitment of Agriculture Development Officer Jobs.